It was a hot summer night that called for something cool and mellow. Drive-in movie theaters had intrigued us for a few summers now. It was time to see what the historic hype was about at the Vali-Hi theatre in Lake Elmo, MN. What? A Drive-In, not Thru? We packed a cooler of beverages and some licorice and headed out around 6:45. 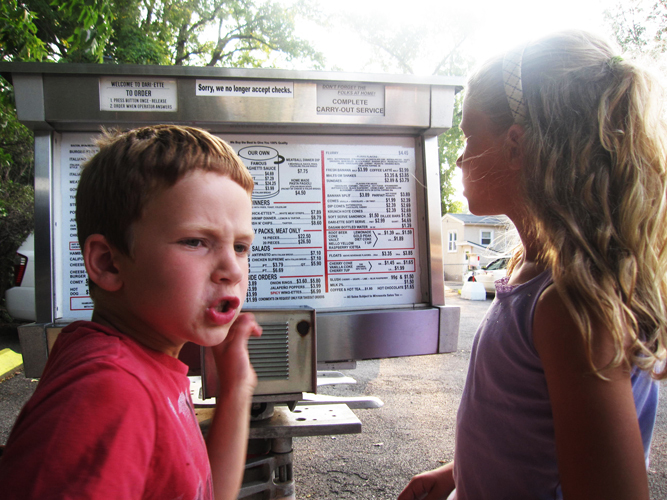 As a prequel to the theater and along a drive-in theme, we stopped off 94 and White Bear Ave to order up some shakes from the Dari-ette Drive-In off Minnehaha Avenue in the St. Paul Dayton’s Bluff area. We backed into our spot and the kids immediately hopped out of the back seat to check out menu stand on the driver’s side of the car. The closest experience they could recall was ordering a smoothie at McDonald’s and having to park in a designated space to wait for an employee to hand deliver it to us. For two very large shakes that the four of us planned to split, the total was just under $8. We corralled them back into the car for the full drive-in experience. The Dari-ette, 58 years and going strong, had some pretty messy items on their menu – italian everything (meatball sandwiches), finger lickin’ chicken and saucy ice cream concoctions. Miraculously, we spilled nothing. The night was still young. We arrived around 8:00 to Vali-Hi and breezed through – $8 per adult and $1 per kid ages 6-12 (5 and under: free). We drove around a little perplexed about the protocol at first. We checked out our neighbors and settled in. Then we discovered they were downing Coors Light sitting atop a blow-up mattress in their flatbed. Things were going to get weird. The doors had opened earlier, so we were about three-fourths of the way back from the screen. 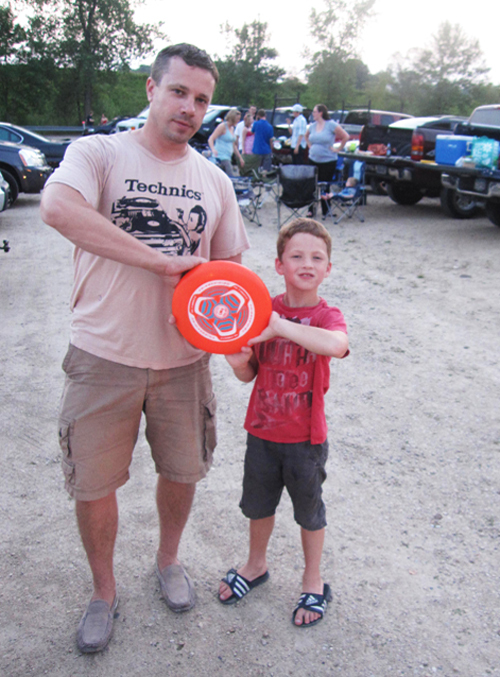 Large groups of people congregated in mass tailgating style, all of the mini-van hoods locked in up position. 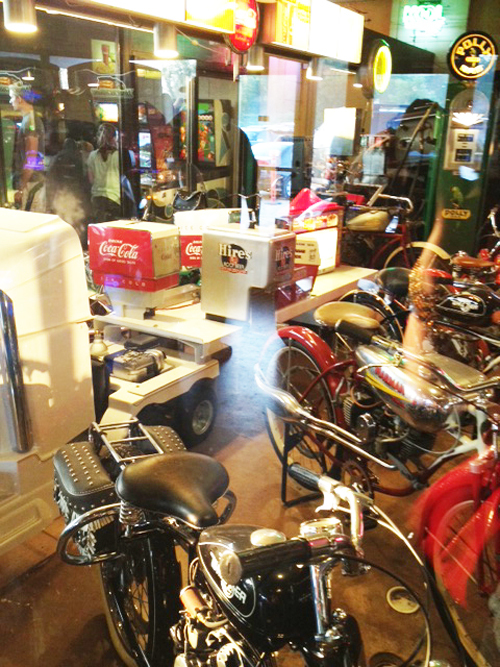 Anything went – grills, coolers stocked with alcohol – – the works. People played football, frisbee and any mobile game possible. Some people had tiki torches staking out their space. Trucks with overstuffed sofas were strapped in their truck beds. I think the kids’ jaws dropped open at that one. We tried to fit into the scene with our Subaru and two portable chairs. Prior to the movie, we played frisbee and checked out the arcade games, classic pin-ball machines and a fortune teller (like in the movie Big) at the center snack building. My 7 year-old son insisted on popcorn so we joined the growing line of people getting their last snacks before movie 1. I marveled at the young kids here (including our own 7 and 9 year olds) for a series of PG-13 movies. Apparently no matter for them. First in the series of three was Spiderman. Dusk settled in and the movie began. In our car the audio was great, outside the car in our seats, we relied on the sound from neighbor’s speakers which was less clear. I had my doubts that this crowd’s socializing could be silenced, but then I realized, they were totally into the movie and this whole scene. Another miraculous happening – – not one mosquito bite. Granted we had our Burt’s Bee’s on… but still. As my husband and son began packing up before the credits rolled, my daughter and I calmed them, We are watching the movie in its entirety. With our two items packed, we zipped out right after the credits. But not before my husband shined our brights on the people behind us who ran their car engine with car windows closed through most of the movie and probably couldn’t have told you what movie was even playing. What do you expect? It’s free reign at the drive-in. It was far from the mad rush out we anticipated. Then it dawned on me, most of these people were in it for the long haul. They were staying for Men in Black and the next flick featuring Adam Sandler: the Triple Feature. It would be after 4:00a.m. when some of them rolled out. As I passed a couple in their front row papazan, I wondered Did they bring their skillets for and egg and hash breakfast? The kids were too jazzed to fall asleep on the ride home. There was already talk about hitting the Cottage Grove Drive-In for IceAge: Continental Drift soon. I loved the nostalgia of the night, but the glimpse into the summer drive-in subculture was a bit of an eye-opener for me. The lot was packed which told me that the drive-in movie theatre concept is alive and well. 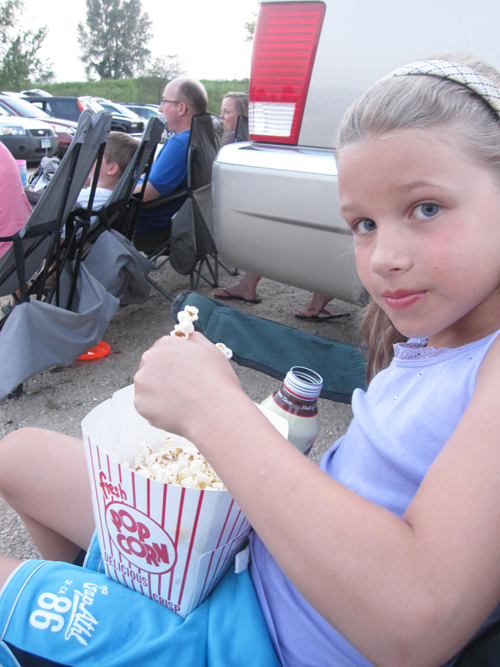 If and when we go back, we’ll bring along our entourage and the right stuff (coolers, couches and kids) to make the most of all the modern day drive-in has to offer. Exploring around Minneapolis has been an adventure. Recently my 9-year-old, Ava, and I set out on the newly paved Chicago Avenue that added designated bike lines last summer. We chose a Sunday morning 9:30a.m. time slot to begin the trek. From our neighborhood, it was a 10 block commute in the Chicago Avenue lane to Minnehaha Parkway (around 51st Street in Minneapolis). Despite having a bike rack — it is not the most hassle-free bike route option — I really prefer setting out from our house when possible. After losing the Saturday battle for a bike ride together, I took a rain check from Ava. Now she owed me a sunny disposition for our Sunday morning ride. Smiles, sunscreen and moments later, we set out. It was a hot several-city block ride to the parkway with one moderately steep hill. There were a lot of whiny complaints, which I tuned out. Her main focus was the hills – – what a drag to have to endure the uphill battle. But what about the downhill coast that most often followed closely after?, I asked. She glared. There’s a lesson here – No Pain, No Gain; Just Do It, etc. And believe me, I pulled out all the major athletic ad campaign slogans throughout the journey, hoping something would stick. We reach the parkway and jump on, heading east towards the Mississippi River, which literally feels like you’re entering a stream of swimming fish or hopping on the light rail. 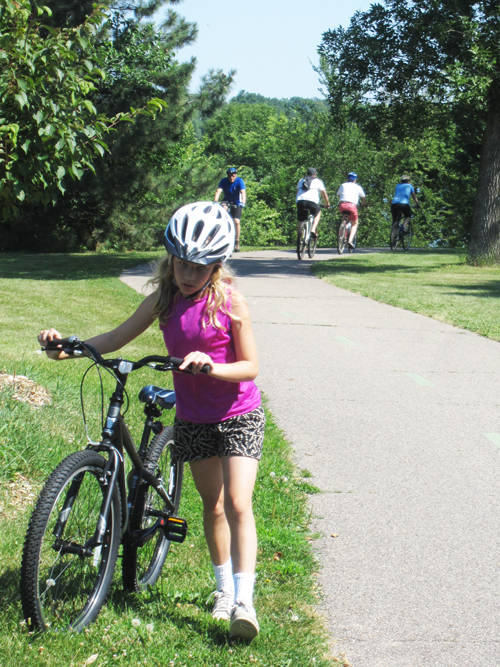 We wind around and discover tons of tennis courts, parks and bridges on the path as well as very seasoned bike riders. I am a bit concerned for her safety on her new bike so we alternate: her first, me following, and vice versa. I like to be in front when we’re approaching a major intersection and in back when we’re coasting intersection-free. We stop just north of Lake Nokomis on the pathway for a photo and a water break (along the parkway, there is no shortage of bridges to see, as seen in our photo). We cross up the way from this bridge over the vehicle traffic in the pedestrian/bike cross walk. I witness a near accident between veteran bikers – one riding in the car lane and one crossing over in the ped/bike lane. Glances are exchanged. Ava and I are glad we played it safe and held back for that one. We have an open, towering view of downtown over Lake Hiawatha before we cross a bridge and continue east. Curiosity pushes us further. We come to the light rail path along Hwy 55 (Hiawatha) and we turn right (south) and after a short while (.5 miles max), we arrive at the Historic Longfellow House and Gardens (photo opp here) where no biking is allowed. The various options along the bike path have us a little confused, but we cruise by the Princess Depot and head east to cross the River Road. We arrive at Minnehaha Falls, where we have driven to and hiked numerous times. Biking there is a new experience. 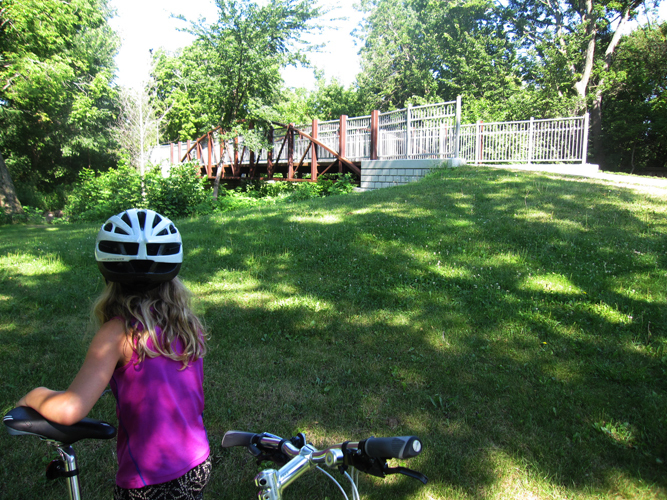 We pause for a moment on the bridge that overlooks Minnehaha Falls. We make note of the Dairy Queen for future trips, then turn and head back home. We have helmets, but not other official biking gear. 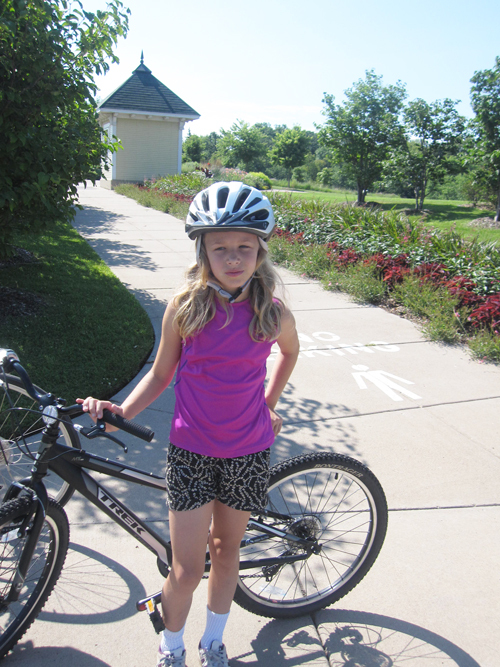 I’m overly cautious – – it’s difficult with the winding trails to make sure Ava and I pass slower riders safely. Lot’s of “On your left“‘s are spoken. We arrive home and I make a mention of our 5 mile exploration and begin to detail it out to my husband, “that’s more like 8 miles,” he says. Okay, I guess so – -“we” were having too much fun that I may not have calculated it correctly. It’s about 11:oo so we rode for 1.5 hours. I consider the journey and agree with him. I’m sure the paths will be more crowded later in the day with cyclists that plan full-day routes. Next time, after Freewheel Bike installs her carrier rack, we’ll pack a lunch for the midway point. Hopefully, there will be less complaints about the uphills, seeing how she screamed with delight on the long downhills. I can hardly resist dousing her spirit with a words of wisdom moment, “Life is an Uphill Battle,” but I leave it be. She is already wondering about our next outing… and that’s a good thing. On the heels of my 9-year-old daughter’s birthday party, we rolled right into my son’s two weeks later. 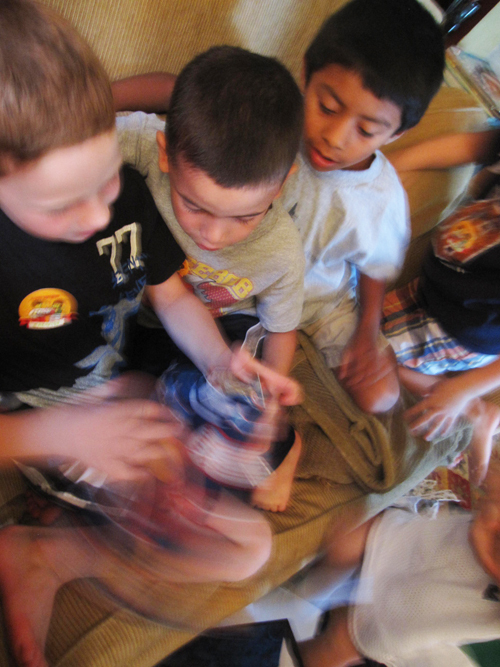 He was going to be 7 and had never had a friend birthday party with more than a few friends. Last year he opted to go to the movies and out for pizza (Cars II and Fireside Pizza). This year, in a new school where all of his other classmates were having parties, he decided he should invite a larger group and we’d host it at our house. It can be a challenge to find a weekend in the summer to host a party. People have plans in Minnesota. We invited 10 boys, 6 were able to attend even though the invites went out about 12 days in advance. We settled on a Lego theme and based on the only time slot over the weekend we could find (10a-12p), we agreed that waffles would be served. The Lego my Eggo party moved into the planning phase. 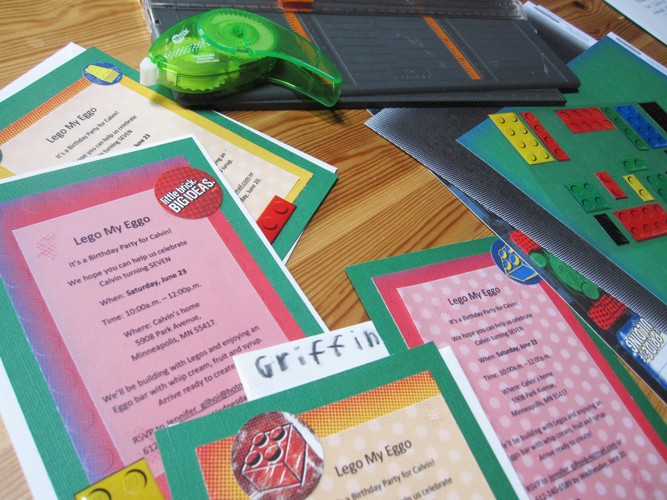 I uncovered some Lego scrapbook paper and stickers I meant to use ages ago and printed the invite copy on vellum. My son Calvin, eager to help with the assembly, cut the paper in the slicer machine and used the gliding tape dispenser to attach the layer of paper and vellum. Then the puffy Lego block stickers were adhered. We put the invite list together and gathered the addresses and left the final steps until the next day. He was up early the next morning and wrote everyone’s name, based on his own spelling rules, largely on the only envelopes we had. I applauded the effort and tried to clean up the chalk-like smears on the flap side. I addressed the front side immediately and we headed to the post office to get them in the mail. I had help with the party prep as my parents were visiting. Critical, in my view. The weekend prior, Calvin and I hit the Lego store at the Mall of America. He spent his birthday money on the Pirate Ship and I found a Lego party kit at 50% off. Three days in advance, we shopped for food and two days prior we reorganized the house to set up Lego stations. The day prior to the party, my Mom found the perfect waffle-maker. It made 6 strips of 4 square-long waffles. The party was on a Saturday morning, which meant devoting all Friday night to the final details. I made 2 9″ chocolate cakes to layer and a pan of cupcakes. With the rectangles stacked, I trimmed off the cupcake tops, frosted them and attached 6 of them to the top of the cake. I was going for a Lego brick look. I sprinkled blue and yellow over the white-frosted cake and called it good. We set the table and came up with a rough agenda, just to be sure we could keep the group entertained. We made one area where the boys could draw ideas for their Lego creation on graph paper, then see how it translated into a Lego structure (Legographics). In four other areas: boats, cars, dinosaurs and houses, we set out some pieces that matched those items. In another area, we had the large Lego flatboards so at the end, they could bring everything to contribute to the Lego City. The boys arrived at 10a and tore into the party favors by their place setting – a birthday Lego guy, graph paper and Lego construction card (all in the kit). Calvin also created a one-of-a-kind Lego person for each of his friends. I started them five minutes prior to the party and kept them warm in the oven until we had enough for everyone. 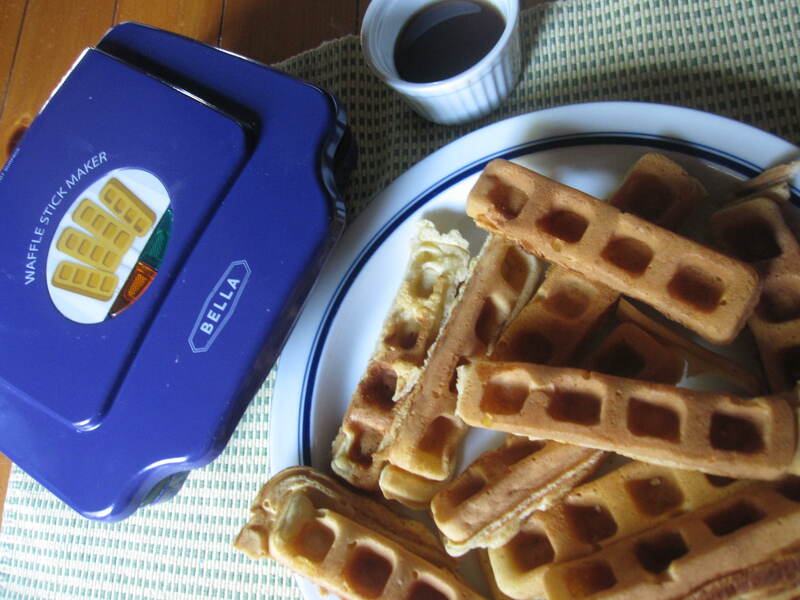 The waffles were super easy to make, about 3 minutes for each batch. We called it a Lego Bar and accompanied it with a side of chocolate milk. With their waffle strips served up, they chose their fruit and syrup toppings and let loose with the Redi-Whip – a delight, no doubt. After clean-up, they started on the Lego assembly. The graph paper drawing was a little advanced. One boy created a rollercoaster, another a train. All to contribute to the city. They were focused for a good 45 minutes. Around 11:10, Calvin opened his gifts from his friends, in order by first letter in their first name. They all laughed at the silly cards. 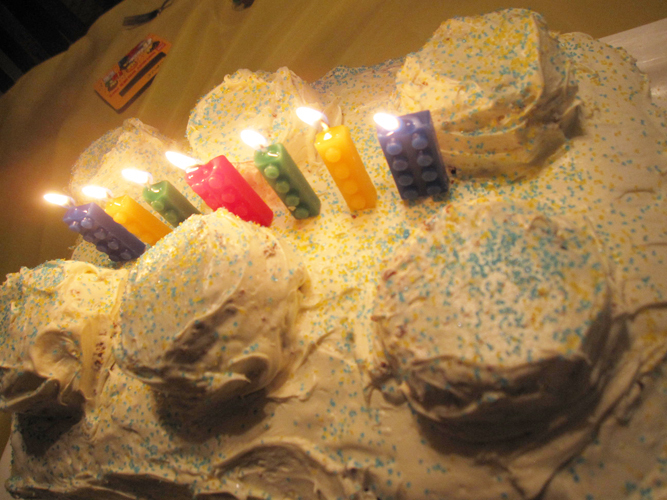 Then it was time to sing Happy Birthday and have a sliver of the Lego cake, its identity made more apparent by the Lego brick candles in primary colors. With 20 party minutes left, my husband whooshed in and made the best of their sugar high with some old-fashion Simon Says and party games. Parents arrived at noon and we sent everyone off with their Lego guys and a plate of Knox Blox in blue and red. We pulled it off. Calvin set up his thank you card writing station, but progress is slow-going. We talked about the outing from last year as compared to this year’s stay-at-home party. He was on the fence for what he preferred. For the seventh, he shared fun times with a larger group of friends and we had lots of leftover cake and a fancy, new waffle maker to extend the celebration. However, until those thank you’s go out, I’m not lego’ing any eggos.